If you've promoted your software with us before at BitsDuJour you might be interested to learn that we've added a new feature to the vendor control panel. 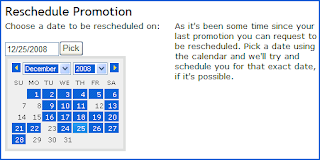 You can now easily reschedule your promotion with us, and even choose the day that you want your promotion to run on. We've added a new drop down calendar so that if three months have passed since your last promotion, and you've had reasonable sales before then you'll be able to quickly pick a day. We hope you enjoy the new flexibility, we've tried to make everything as quick and easy as possible for you to sell your software through us.